Uncategorised (Another) one on the way! (Another) one on the way! I've been keeping this under-wraps for quite a while, but think it's about time I mentioned it to everybody! Me and my wife are expecting our second child at the end of January. I'm not quite as terrified as I was the last time around, but there are a lot considerations I have right now. How will we cope with two children? (Considering how much of a handful just one is!) How will it affect our little boy Clark? Is it realistic to attempt to go for Supernova Elite in the same year as having a newborn baby? Although I do worry about these things, I think it's simply a case of taking them as they come. Preparing for our second child whilst still only 26 years old makes me think about how unorthodox my path in life is for a professional poker player. 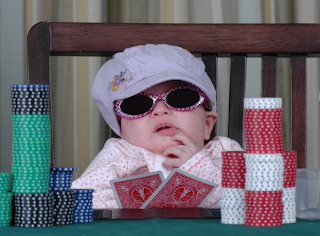 Of all the twenty-something poker players I know, I can only think of one other that has a child. One out of many. It does have a certain impact on my on-line play that other on-line grinders wouldn't have to contend with. I tend to play during the daytime, out of peak hours, to make my working life more normal. After being someone who could never wake up in the morning for much of my life, I actually like this schedule though. Getting up at 6am feels like a much healthier lifestyle than waking up after 11am. It definitely eats up a majority of my spare time, as the time I spend away from the tables tends to be with my family. This does make it harder to see my friends and go out, but I still do my best. And it's not as if I'm losing out on enjoyment here, I love spending time with Liz and Clark. However with all the success in British Poker, most recently James Dempsey's recent bink in a WPT, I do occasionally give a thought to all very successful young British guys that go out on the circuit, like Flushy himself, Jake Cody, John Eames, Toby Lewis, Sam Trickett, Rupert Elder, Stuart Rutter, Dan Carter, Dave Nicholson, etc etc. 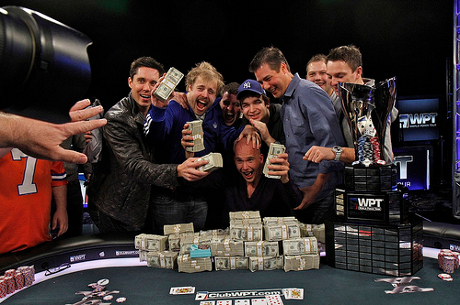 All these get to travel the world playing poker, and it's hard not to be a little jealous of their lifestyle and their success. With few responsibilities they seem to be able to go where they want when they want, but I'm pretty much restricted to staying at home for the most part. I would just miss Clark and Liz too much. My trip to Vegas for 6 days in the summer showed me I just wouldn't be capable of going away without them on anything like a regular basis. However I always come to the same conclusion. It's silly to be jealous, even fleetingly. I am very lucky to live the life I do. I've found the woman I want to spend the rest of my life with, and have a child I love more than anything in the world. Becoming a father was the best thing that has ever happened to me, and I can't wait to have two under my wing. My apologies if this announcement. has turned into a glorified brag post by the way. I'm not even sure I could hack the poker superstar lifestyle anyway. For a start I don't profess to have anywhere near their talent in poker, and it's very possible I wouldn't even be able to do what they do and be particularly successful. Also, being the variance nit I am, as well as someone who likes being "home" (I live 5 minutes away from where I grew up ffs! ), it's probably not the life for me. I should just be thankful that I am able to make a solid living at a job I somewhat enjoy, and that suits me well, allowing me to spend plenty of time with my family. I've managed to find my niché in poker, and I should just be pleased to have one! Being told of Liz's first pregnancy was the spark that led me to be a disciplined grind-horse, and I think the responsibility of being the sole provider for two children might help give me the motivation I need to make 2012 the year where I work the hardest. I'm just happy that the missus didn't go into labour whilst I was playing a SNG session, and me having to tell her "Not now dear, you'll have to wait until I've finished all these games! 2 Comments to "(Another) one on the way!" you seem so proud of your child in the video. I think a second won't hurt. Massive massive congrats on the soon-be-born child, everytime i've heard you talk about clark you seem so proud I've no doubt you're an amazing dad. I hope in the not too distant future my life is a lot less like mine and a lot more like yours.